A staple of hawker centres. Fishball noodles are a Singapore staple found in almost every hawker centre and coffee shop. The simple combination of noodles in soup or chilli oil and balls of minced fish means that there is little variation for a stallowner to make their dish a cut above the rest. Hock Lee Fishball Noodles, however, has made that leap into greatness by using fresh ingredients that result in a purity of taste. Hock Lee’s fishballs in its delicious broth. Located in Albert Centre market and hawker centre, near Bugis Street and just a few steps away from the popular Kwan Im Thong Hood Cho temple, Hock Lee is impossible to miss. Even before 08:00, when many other stalls are still setting up, it’s not unusual to find a queue of 20 hungry people in front of the stall, waiting patiently for their S$3 fishball breakfast. The elderly couple running the stall and their two assistants are efficient, so the wait is usually 15 minutes at most, no matter how long the queue may look. 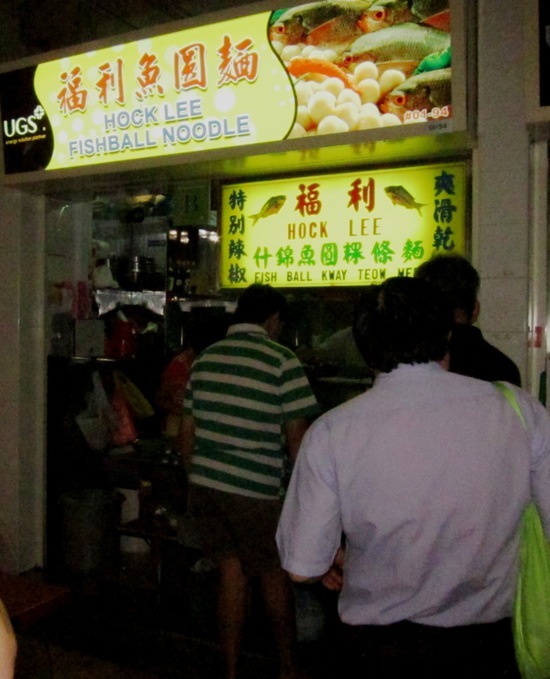 What makes Hock Lee fishball noodles so popular? As with many noodle dishes in Singapore, you can order dry or soup versions. The dry variety at Hock Lee, which does still come with a side bowl of soup, is good but not spectacular. Choose from the popular yellow flat noodles (mee pok), round noodles (mee kia) or white flat rice noodles (kway teow), which come slathered in a mix of mainly chilli oil and chilli and tomato sauces. A depth of flavour is achieved with a dash of minced garlic and crispy bits of fried pork lard. 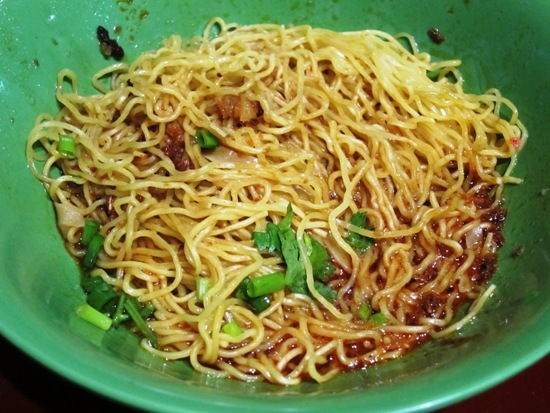 Mee kia — in chilli oil with crispy bits of lard. As with most hawker stalls, soy sauce and sliced chillies are provided if you need some extra saltiness and heat. But why bother, when the soup is already so tasty? A typical breakfast queue at Hock Lee. If you do go for the healthier soup variety, you’ll be able to savour a larger bowl of this delightful broth with your noodles drenched in it. Should you enjoy spice however, the dry version lets you have your chilli oil noodles and enjoy your soup too. You could have a separate order of fishball soup, for more of the fishballs. Hock Lee frequently sells out before lunch, so breakfast is your best bet. If you’re staying in the Bugis area, make sure you pencil in a fishball noodle breakfast before going for a stroll in the neighbourhood!